Mr. and Mrs. Jacob Greenfelder, Jr.
John E. Bragg served as a legislator in the Ohio General Assembly during 82nd, 83rd, and 85th sessions (1917-1921; 1923-1925). He was a fifty-year member of the Margaretta Grange, a charter member of the Ohio Farm Bureau, and a lifetime member of the Woodmen of the World. 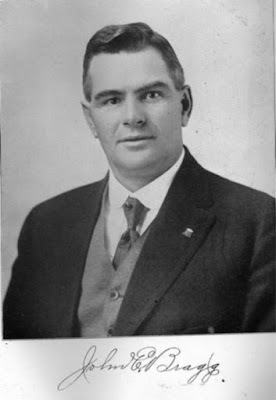 John Bragg married Zella Deyo in 1893, and they were married for over sixty-three years. Both the Bragg and Deyo families have roads named for them in Erie County. On January 24, 1947, Mr. A. B. Graham, who is considered the “father” of 4-H programs in the United States, sent a letter to the Sandusky Library. 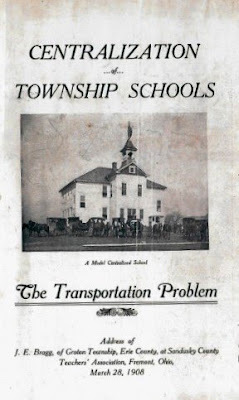 Under separate cover, Mr. Graham mailed a publication containing the address by J. E. Bragg on the topic of “Centralization of Township Schools: The Transportation Problem.” The address was given in Sandusky County on March 28, 1908. In his address, Mr. Bragg promotes the centralization of rural schools. 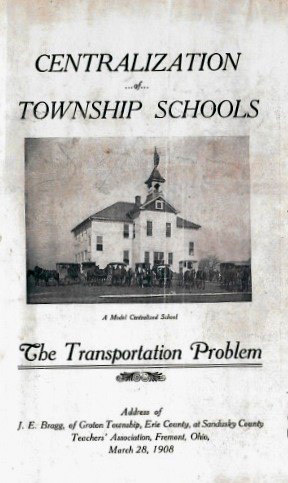 He discussed the process of bidding for transportation provides and gave examples of how other Ohio school districts handled centralizing their township schools. He went to cover discipline of the students, safety issues, and the quality of the construction of school vehicles. At the time of the publication, horse drawn vehicles were still in use. Pictured in a page below is a photograph of children arriving at school, circa 1908. 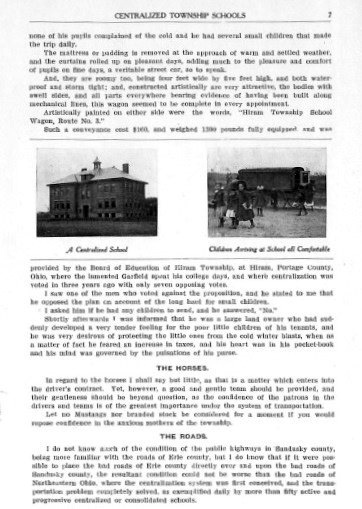 Mr. Bragg concluded his address with: “Friends and neighbors, study this school problem, both centralization and transportation, and I doubt not if you will let the torch of reason burn, you will soon agree with me if you do not today, when I say the little red school house has outlived its usefulness, and it is high time that were beginning to enlarge its walls.” Of course, today the one room schoolhouse in Ohio is now the exception, and many schools do have centralized transportation plans. 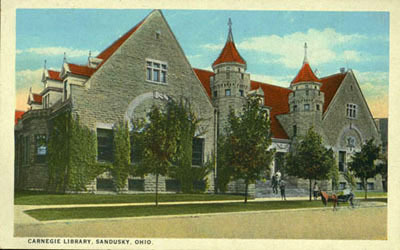 Mr. Bragg’s address is found in the Schools Collection of the Archives Research Center of the Sandusky Library. You can read Mr. Bragg’s obituary in the November 12, 1956 issue of the Sandusky Register. It is interesting to read about the political thoughts regarding education from over one hundred years ago.